Tidy Plates enhances World of Warcraft's floating health bars - commonly known as 'nameplates' - and provides a built-in API which can be used to create your own design. This download comes with several theme packages, but many alternatives are available. I'd love for you to use the Curseforge Ticket System for submitting bug reports. I realize that this isn't convenient for some people, so I won't get upset if you post reports to the comment section. If you include an error log in your comment, I will probably delete that posting (after copying the information) because they're usually very long and can fill up an entire page. Use the command, '/tidyplates' as a shortcut to the interface panel for Tidy Plates. On that panel, you'll be able to select from a list of installed themes. The theme you choose will define both the appearance and features. Class Colors should be working. On health bars, at least. I briefly tested them. Cast bars.. Early next week, I hope. Calm down, take a deep breath. It's Friday, July 22nd! It's time for beverages! - Core: New value: unit.healthmaxCached, which is updated on target and mouseover. - Core: Where available, uses the healthmaxCached to create real numbers. - Core: Figured out what the other statusbar is.. incoming heals. But you guys already knew that. Hiding that stuff, for now. - Partially updated the core to the new internal Blizzard nameplate layout. * Blizzard theme; "Fixed" the graphic alignment? * Aura Widget: Support for Infinite Duration (0=Expiration Time) auras, like "Storm, Earth, and Fire". * Hub; Cast Bar: Changed the logic of Friendly Unit cast bars. Perhaps this will help Capacitor Totem visibility? - Added a second level Cache, which is looked at FIRST; not a saved variable (ie. erased on logout). This should reduce frequent lookups to the BIG table. - Added a 'lastSeen' feature, where the function will timestamp when the unit was seen, and remove any unit entry (on login) not seen for 60 days. * Removed 5.x Specific core code. * Fixed Mouseover issue; 6.0 no longer uses the Highlight region to indicate mouseover; Using Name text color change. * Fixed Elite/Dragon Texture being reshown; Using :SetAlpha(0) rather than nilling the texture. * Core: Alpha transition animation has been restored. You can disable it in the /tidyplates panel. * Core: Added: unit.isMini = boolean. This will eventually replace "unit.platetype" and "unit.isTrivial". Not anytime soon, though. * Widgets: Fixed the Class Icon widget. Finally. Added class-colored borders to each icon. * Hub: Added a new checkbox to "Scale"; "Auto-Scale Mini Mobs", which will downscale those tiny guys, ironically making it easier to target. * Hub: Added a new checkbox to "Unit Filter", "Override Target Scale", which will maintain the filtered scale of Targeted Mobs. * Hub: "Use Blizzard font" should work properly again. * Hub: Merged "Style" into "Headline Mode"
* Hub: "Health Bar" gets a couple new choices; Namely, separate coloring options for Friendly vs Enemy plates. * Hub: Removed the "Warning Border Glow Mode" selector; Don't worry! There's still a Warning Glow, but it's turned on/off within the "Threat" category. * Hub: Added an option to "Spell Casting", "Enable Friendly Castbars"
* Themes: More fixes for text issues. * Themes: New Font: Started replacing "Accidental Presidency" with "Roboto Condensed" across the bundled themes. - Widgets: Combo Point: Anticipation "fix"
- Widgets: Unit Cache: Stores non-local units with a " (*)" suffix. - Core: New unit data: unit.rawName, strips the (*) from nameplate names. - Core: The carrier frame is now globally labeled with a unique frame name. - Revert fix for viewport mod interaction. Works for some, not for most. Continue using "Compatibility Mode" to fix Viewport. - Core: OnShowCastbar will now check for unit health before proceeding, hopefully avoiding errors when the Castbar's OnShow handler is called early. - * Fix for Viewport Mods (specifically, Sunn), particularly, when the actual vertical viewport is decreased. * This should reduce or eliminate the need for Compatibility Mode. - I may have fixed some bugs. Or maybe that was a dream. Hard to recall whilst under Benadryl's spell. - Ok, I definitely changed some things, and I'm not getting errors in game. That's a good sign. - Made some changes to (hopefully) fix 1) debuff tracking oddities, and 2) lua error using health text. - Added a workaround/fix to the broken Blizzard function, InterfaceOptionsFrame_OpenToCategory. Slash command shortcuts for /hub and /tidyplates will now work properly. - Added a Compatibility Mode checkbox to the interface panel. This will fall back to older anchoring methods. - Core: The OnShow handler will skip all data gather on that first cycle; The Alpha data is (still) unreliable, causing GUID association issues. - Aura Widget: Fixed issue where aura is briefly shown, then hidden. Should be fixed. - Added a copy of the reference to healthbar and castbar. for Threat Plates Compatibility. - Reintegration of 6.10 Core, which includes reorganization and rebuilding of the main engine. - Check unit.health on spell cast functions, to catch premature update calls. - Basically, I've given up trying to quickly patch up 6.10. I've reverted to 6.9.9, and made the changes necessary for it to work with WoW 5.3. If you want the Performance Mode stuff, grab the old version, or keep an eye out for it to be Re-Beta'd as 6.12. - Core: Set initial fonts during Init/Hooking. Removes the possibility of :SetFont() errors. - Core: Fixed a major typo. Should fix SetStyle/Headline Mode and ClassIcon LUA errors at the very least. Might explain some of the other elusive bugs. By default this is NOT enabled, reverting to the older, slower, reliable method. Using Performance Mode may break HHTD and other nameplate addons. specific as possible in describing the condition of the game when it occured. - Core: (Since 6.10.2) Performance Mode: This enables the performance improvements introduced in 6.10. - Core: Set initial fonts during Init/Hooking. Removes the possibility of :SetFont() errors. Not sure why I didn't do this years ago. - Panel: New Option: Performance Mode. This enables the performance improvements introduced in 6.10. By default this is NOT enabled, which uses the safer parenting method. - Using "Performance Mode" may cause problems with other nameplate addons. - Panel: Reverted the dropdown menu init changes from beta4. Seems to be messing up the panel. - Core: *Parenting Tidy Plates Frame to UIParent & Reanchor back to base nameplate. Performance boost. - Core: Removed the 'Spell Cast Watcher' component; 5.3 natively adds this function. - Combo Points: "Anticipation" fix for non-english regions? someone needs to test this, cuz I'm in an english region. * The new anchoring method is still new, and weird bugs may surface. Post yer bugs! - Hub: Added "Selective Optional Text"
- Core & Aura Widget: Made some changes to reduce extraneous calls. - Aura Widget: "Show Dispellable Auras" should work, now. Ran some BGs, and things seemed to work. - Hub: Added a warning, notifying the user when they're not using a Hub-compatible theme. - Aura Widget: The old method of applying the aura widget has been re-added; The new method (described somewhere below) is still preferred! - Hub: "By Threat" Warning Glow Mode now incorporates "By Enemy Healer", so it can be used for Pvp without changing config. * These changes may evolve into more situationally reactive configs... we'll see! - Widgets: HealerTrack: Should more reliably and quickly detect the spec of the enemy units. - Hub: The Widget creation and update functions will look for, and call: TidyPlatesGlobal_OnInitialize, TidyPlatesGlobal_OnContextUpdate, TidyPlatesGlobal_OnUpdate. TidyPlatesGlobal_OnUpdate() is called when other data about the unit changes, or is requested by an external controller. - Mousing over a nameplate will temporarily bring that frame to FrameLevel 1, which should help targeting in crowds. - A few other little things that I can't recall now. I need sleep! - More bug fixing, which seems to be a blessing in-disguise, since it's yeilding some removal of redundancies, and (hopefully) incremental improvement in performance. - Hub: Added a new Filter Item, "Filter Mini-Mobs". This'll allow you to scale and fade those pesky mobs with mini-nameplates. 70% works well for me. - Added some additional code to check for nil values in the Default Filter Function. - 2. SetHeatlhbarColor now accepts two rgba sets - r1, g1, b1, a1, r2, g2, b2, a2 - which define the healthbar color+alpha and the backdrop color+alpha, respectively. - Core: Deprecated "style.frame" - Blizz made some changes, rendering this option obsolete. - Aura Widget: Square/Small Auras will now terminate/expire properly, and call for a delegate update. - Hub/Aura Widget: Added "Track Dispellable Debuffs on Friendly Units", which will allow you to track and highlight debuffs on friendly units that need to be dispelled. "Magic", "Poison", "Curse", or "Disease". Have I tested it? Hahahaha..he.. um, no. - Hub/Aura Widget: Removed prefix, "No"; Useless in the current evolution of the Hub Filter system. - Hub: Added Health/Optional Text Mode: By Arena ID. I have no clue if it works. - Hub: Multi-Mode Functions will cross-check the table index, preventing out-of-range values from throwing errors. a single setting under the "Threat" Category, allowing you to control the Threat Mode for all Threat functions. - Raid Tank/Target Watcher: Fixed unitid/raidid issue. - TAPPED mobs now are a unit.reaction member. No way to tell between tapped friendlies and tapped enemies (this does occasionally happen). I will make the Reaction colors configurable within the Hub UI in the near future. - "Tapped" units (colored light purple by the Blizz nameplate system) will now register as "Hostile NPCs" in Tidy Plates. This is partially inaccurate, since the tapped mobs could be neutral (like target dummies), but there is no way to discriminate this from the plate. - Disable Tanks module by default. Add option button to hub. - Hopefully Fixed Off-Tank coloring issue. - Patch 5.1 Compatibility: The Blizzard nameplate format changed, breaking the addon. This update restores Tidy Plates' functionality. - Corrected another error in the spell cast watcher; "StopCastAnimationOnNameplate" is now properly referenced. This only affects arena matches. I don't do arenas, so this was never properly tested. Let me know if more errors pop up. - Corrected a typo in the spell cast watcher; "StartCastAnimation" is now properly, "StartCastAnimationOnNameplate". - Added code to verify healthmax values. - Sets framelevel to 0. Targetted plates are raised to 1, which still does obscure the chatbox and minimap. This also occurs with the standard Blizz nameplates, and cannot be corrected without raising the strata or level of those other frames. TidyPlatesHubLocalization["Style"] = "Translation of STYLE". See TidyPlatesHub\Lists.lua for an example. Future versions will add a "Dump" mode for outputting all the text that needs translating. - Changed the background, anchoring, and font sizes in the Hub, for readability. - Threat Line Widget: WTF!!! Shootin' from the hip, again. - Raised MinimapCluster, PlayerFrame, and TargetFrame to "LOW" framestrata to prevent nameplates from obscuring those UI elements. - Currently, there is no way to fix the brief 'flash' of the Blizzard nameplate art before it becomes active; It's a bug for the Blizz folks to solve. - Aura Widget: Fixed error, where certain auras filtered by spellid were not being displayed. - Threat Line Widget: Added some code to prevent it from accidentally becoming REALLY long. - Added: TidyPlates:EnableFadeIn() and TidyPlates:DisableFadeIn() functions, to control the nameplate fade-in mechanic. Default is Enabled. - Added "Stance of the Sturdy Ox" to the Tank Aura list. This should fix some "By Threat" oddities. - Added Monk specs to the HealerTrack widget. - Fixed: Bug where current theme selection would be lost when logging-in. - Added BUFFS to the aura widget. - Rearrangement of the Hub panel. The debuff widget has been moved to its own category. - Enhanced both the debuff widget and the spell cast warning module with support for Arena unitid event capture (via the standard event system, rather than the combat log). - Functions which have been renamed for MoP have been replaced by an internal function (provided by Tidy Plates) which is aware of the current client version, and will choose the appropriate function. Instead of displaying a graphical health-bar, we can display critical information using just text, reducing the surface area of the nameplate and revealing more of the game world. The Headline style can be mixed with traditional Health Bar nameplates to improve your awareness and reduce visual clutter. In addition to numerous performance improvements, the current version of the Debuff widget now includes the option to use Square icons! Click the minimize button to unsnap the Hub panel into it's own smaller, draggable configuration window. Use '/hub' to quickly enter the active Hub Panel. In the Hub, use the 'Bookmarks' button to jump to a category. This is a simple method of transferring profiles between characters. Clicking the Hub's 'Copy' button will save your settings to a global database. The data persists even if your computer is turned-Off. Clicking the 'Paste' button will replace your current settings with the Copied settings. You can paste between characters on different servers. Using the 'Shift' key while clicking will use a different clipboard, isolated to the Hub's Role Type, but still acessible between characters. In other words, you've got three slots (Universal, Tank, and Damage) to copy your settings. Refinement of the caching systems has reduced Memory and CPU usage. Some folks have seen dramatic FPS drops. This update should fix that stuff! - Under the "Style" category, all references to "Text-Only Plates" or "TextPlates" have been changed to "Headline Mode". This change is intended to distinguish the style modifier from other references to "Text". I'm sure some of you will hate this (can you come up with something better? ), but I'm hoping that less cranky folks find the new grammar to be more intuitive. - To support the "Headline Mode" name change, I've added a new category. Can you guess? It's, "Headline". - I've grouped the "Color" and "Text" categories into "Color & Text", and moved them to the second-category position. Why?? 1: "Color & Text" controls the appearance of the default 'Health Bar' style. 2: Underneath, "Headline" controls the appearance of the 'No Bar' style. Thus: This arrangement puts these options close to where the user selects the modes, in the "Style" category. - Square Debuff Icon Option: Added a new Debuff Widget option, "Debuff Style", which allows the user to select between the traditional "Wide" debuff format, or a more squareish "Compact" style. The column count is increased to 5 for the "Compact" style. - On certain themes, the position of your debuffs will be adjusted to allow the combo point widget to comfortably fit (on Rogues and Druids, only). When the combo widget is disabled, the icons will "snug" themselves closer to the plate. * Unit descriptions (player guild name, or NPC role/title) will not be displayed while in an instance. This is to avoid the CPU overhead that occurs when searching the database, which could be THOUSANDS of entries. This is a direct cause for massive FPS drop, in some cases. * A side-effect of these changes is the clearing of user's stored guild names and NPC titles. This is required to get the desired performance benefits. - Improved HealerTrack.lua, with help from Curseforge user, dakunesu. Improves detection of healers in battlegrounds! Rockin! - Added a "Minimize" button to the /hub UI panel. Clicking this will detach the Hub panel from the Interface Options window, and make it smaller. Good for configuring stuff while playing. - The Copy & Paste buttons for the Hub panels now work with a unified Clipboard, so you can Copy & Paste between Tank and DPS panels. Holding down "Shift" while clicking Copy or Paste will use the original Tank/DPS-specific caches. - New Hub Option: "Bring Casting Units to Spotlight Scale"
- Unit Cache should filter out reputation names. This fixes an issue occuring when "Colorblind" mode is active, causing Reputation to be displayed instead of an NPC's Title. - "Filter > Filter Inactive": When a unit is marked with a target/raid-icon, it's now assumed to be Active. - More memory tricks/optimization for Mr. Debuff Widget. * Unit descriptions (player guild name, or NPC role/title) will not be displayed while in an instance. This is to avoid the CPU overhead that occurs when searching the database. - Healer track should work again. Expect some new graphics in the future. - Made some changes to HealerTrack.lua, not quite sure if it's working properly. Please test! - Improved HealerTrack.lua provided by Curseforge user, dakunesu. Improves detection of healers in battlegrounds. Rockin! - Square Debuff Icons: Added a new Debuff Widget option, "Debuff Style", which allows the user to select between the traditional "Wide" debuff format, or a more squareish "Compact" style. The column count is increased to 5 for the "Compact" style. - My OCD: Under the "Style" category, all references to "Text-Only Plates" or "TextPlates" have been changed to "Headline Mode". This change is intended to distinguish the style modifier from other references to "Text". I'm sure some of you will hate this (can you come up with something better? ), but I'm hoping that less cranky folks find the new grammar to be more intuitive. - To support the "Headline Mode" name change, I've added a new category. Can you guess? "Headline". * The "By Class" function of Health Bar Color has been changed to, "By Enemy Class". * Added a Health Bar Color function called, "By Friendly Class". * Updated combo widget artwork: higher resolution, etc. * Changed fonts... Neon, Graphite, Grey, and Quatre now use the same font, to keep the package size smaller. * When "Show Party Aggro" (under Threat) is enabled, the "By Threat" spotlight systems for Opacity and Scale will now highlight your unfortunate party members. * The Health and Text colors mode, "By Threat" has been changed to, "By Threat (Auto-Detect). The previous implementation has been renamed to "By Threat (Legacy)"
* When using a tank stance, aura, or form, you'll see the "Safe" color when you have aggro, and the "Warning" color when you don't. When NOT in a tank mode, you'll see the "Warning" color when you have aggro. + Added "By Health" and "By Low Health" modes to Scale, Colors, and Opacity. + Added: Hub, Opacity Filter, "By NPC"
+ Added: Hub, Health Bar Coloring Mode: "By Level Color"
+ Added: Hub, Name Color Mode: "By Level Color"
+ Added: Hub, Name Color Mode: "By Boss/Elite"
+ Added: Hub, Opacity, Scale, and Warning Glow Modes: "By Enemy Healer"
Please look through the new options. I'll happily answer any question. - Added: MaximumDisplayableDebuffs variable under Debuff Widget. This will allow user-configurable debuff quantities. - Debuff widget now provides .unit table from the underlying nameplate, to allow better filtering. - Debuff Priority works for "Show Specific" and "Show My Specific" modes, in addition to "By Prefix"
- The Hub Panels will check the order of the debuffs in its list to determine priority. - Class Widget no longer uses internal class artwork; Instead, the class icon is pulled from the Blizz UI library. - Tidy Plates Hub: Debuff Widget: Spell IDs can now be used instead of spell names in the filter system. - Fixed: Crazy debuffs during Firelands dailies. - When auras are updated on your current target, the caching function will clear the cache before it repopulates the list. - Increased the scope of name/elite status updates. Hopefully this will accommodate the Firelands Smoldering/Blazing Elemental Bug. * Channeled spells now move the cast bar in reverse. - "No Overlap" removed from Panel. Please see "Interface > Names> Nameplate Motion" from now on. - Users can select between two styles (Health Bars vs Text Only), and several different visibility conditions. - If you use the Text Only bars, you might want to check out the Name Text Color options, to spice up that text! * Spell Cast Monitor name search will now strip the "-" from the combat log name, which should fix PvP cast association issues. - Updated description of "Vertical Position of Frame" to "Vertical Position of Artwork"
- Found a bug; The Editboxes contained in my ScrollFrames seem to invisibly extend past the bottom of the scrollframe, which can block underlying UI controls. I've dropped the editboxes to a lower frame level, which is a hack method of preventing problems with it interferring with controls anchored to the bottom of the scrollframe. Will attempt to figure out a better solution. - Using CC will eventually highlight the debuff on the widget, but for now it acts as "ALL"
r199	- Raid Tank Coloring in Tank mode. Automatically used when in "By Threat" Modes. - Created a group information watcher. .Type = "solo" Returns the group type; "solo", "party", "raid"
- Removed the troubleshooting panel. - Spell cast watcher now watches the combat log for casting associated with marked units (raid icons), and will display the cast warning on those units in lieu of a GUID or name. - The LoadTheme function is now accessible to external software, via: TidyPlates.LoadTheme("name"). - Raises frame level of current target to a high frame level (126), and return it to previous when done. - fixed: highlight region used to occasionally turn on when the nameplates would show. - The theme loader will now call 'theme.OnActivateTheme' (a theme function) when the active theme is changed. it passes two value to the function: the active theme table, and the active theme name. - The theme loader will call the theme.OnActivateTheme with nil values for ALL themes when a theme is changed. See the Neon/Tank functions.lua for how and why it's supposed to be used. - The new casting system has been finished. Neon/Tank will activate it automatically, but you can use '/run TidyPlates:StartSpellCastWatcher()' to enable it for any theme. - Added "spelltext" which replaces one of the special text fields. - removed specialtext fields. replaced with "spelltext" and "customtext"
- The cast bar may not register interupts fully. But, it will let you know that the unit is casting. Quit whining, you babies. - Preliminary Spell Cast Monitor, in place. Not yet activated. You can find this code under the widget folder, in SpellCastMonitor.lua, if you want to enable/play with it. - At this stage of development, If you can't figure out how to enable it on your own, YOU SHOULDN'T. - Changed the update functions a wee bit to try and reduce CPU load. Some plates may not be updating correctly. Complain wisely (ie. with specifics) and it shall be fixed. - The Grey theme has been left out of 5.15 on purpose; I'm phasing-out including it with the main package. Neon will become the default theme, and Grey+Others will get their own package at some later date. - Messed about with Neon/Tank, and added some new code to test, regarding aggro and friendly unit debuffs. - "Culling of Old Widget Code"
The R65 release contains the test version of Graphite. - Totem Icon Widget Included in WidgetLib. Not yet in Neon. - threat line widget will not update on a unit until there is a threat table; meaning, if you're solo, you won't see anything. - The theme template table (the one with all the default values) has been changed to no longer look like the Grey theme. The Grey theme's media is now stored in its own folder. Choosing "None" as a theme option will show name-text, only. - I'm exhausted and sick and I don't want to even think about this stupid changelog thing and it's a miracle that I'm actually uploading this and I'm going to go to my freaking bed so I can be less cranky in the morning. I'm also hungry, dammit. - Added a .backdrop tag to the statusbars in the style table for themes; The image will appear behind the statusbar. * New theme callback function: OnContextUpdate. Triggered when the GUID of a unit is updated. * Neon and Grey Panels are parented to their own category. - Modified the theme table preprocessor to fill in values on the incoming theme table, rather than generating a totally segregated table. - Modified the core to reduce the workload on data updates. a single value has changed. + As a side note; Since Beta 5 the unit text will no longer turn yellow on mouseover, or red when a unit is in combat. 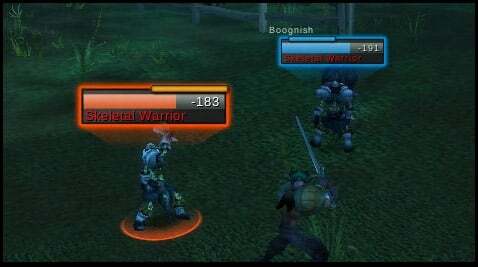 Enemy player PvP colors will now pass through to the health bar color, rather than being replaced by aggro colors. 1. Under the "TidyPlates_Grey" folder, you'll find another folder, "TidyPlates_GreyExtension"
3. Open the file, "TidyPlates_GreyExtension\GreyExtension.lua"
- Problems with OnInitialize not being called (widget errors occuring during combat) An attempted fix is applied. * Health text in Grey; "%x" will now read "x%"
* Threat Line Widget will look to see if the player is marked as a Main Tank in the Raid settings. If so, it will display the person who has pulled aggro (Target of). otherwise, it will assume dps mode and hide the tank name. exsisting objects/widgets before creating new ones. check since it's guaranteed to run after an OnInitialize. Went back to LiberationSans for default font. Why? I like it! + If the Threat Line Widget sees that the targetted character is a "MAINTANK" under the raid roles, it will color the name blue. ++ Tank Mode; "Expands the size of runaway mobs"
++ DPS Mode; "Expands the size of aggro'd mobs"
allowing dual spec to work seamlessly..
* Scale-changing plates will still cause problemos, but now, ordinary plates will work just fine. * Returning NIL in your ScaleDelegate function (if you've got multiple modes) will allow VirtualPlates passthrough. * Still had trouble with nameplate alpha changes updating after the OnShow call. * Clean Up Files - Check! * Rename of "Beta Grey" to "Standard Grey" - Check! See Changelog.txt for the complete WALL OF TEXT! Please keep this site up to date too! Have you forgotten about mmoui?! Please keep this page up to date as well so we don't have to search Curse/Amazon! nice. now i only need to kill that huge white border. any suggestion? What is now with Tidy Playes? Anyone know a future update for 7.3? any reason why I now have to target an NPC for headline view to pop up, otherwise its set for Blizzard default. this is only for friendly targets its seems, and only since updating. Enemy targets are unaffected atm. Not sure if this is part of it, but I am getting no cue to reload ui when i enable or disable headline view, or any option actually in TP. From the recent patch notes: "Addons can no longer perform actions on nameplate tokens." I'm curious if this change affected TidyPlates at all, or if you have any further information on this change Blizzard made in 7.1? Last edited by JustJinxed : 10-26-16 at 12:40 AM. (*temporary) = "attempt to call upvalue 'StyleDelegate' (a nil value)"
Yshaar, my apologies, I just can't support the old stuff. You might try someone who's on one of those servers.. I would like to know if there is a way to just change the color of "hostile" healthbars in the nameplates or just the "friendly player" once to get different colors?????? And i dont want to see class colors for friendly players nameplates! It would be lovely if someone could bring up the time to help me figure out if there is a way. Last edited by danltiger : 09-04-16 at 09:14 AM. Last edited by Yshaarj : 09-03-16 at 04:34 AM. Nameplate activation is under "Targeting"
Nameplates for enemy units work as intended, but no friendly NPCs or friendly players have any nameplates showing up. I tried toggling them in the TidyPlates config menu, to no avail. The default ingame settings window (Interface-Names) doesn't show me an option to toggle them, only minions and minor NPCs, which don't do anything. I'm probably just stupid and missing a setting somewhere, but I've been tinkering around with this for close to an hour now and I'm getting frustrated by my failure. Anyone know what I did wrong or knows another solution than to reset all my keybindings? And, this should be fixed, too. Today friendly NPCs are white. Also I am seeing cast bars show in headline mode when tradeskills are used, such as milling. I am so glad you are updating this addon, I love it. I hope guild names are going to return. Also can we get friendly NPCs to be green again instead of brown and other random colours? Short of that things are coming along great! And, that's not entirely a bad thing. The rewrites are going to enable some cool stuff.. I'm using quatre and when I target a mob, there's another bigger nameplate that appears in the background but it is very transparent, looks like the default blizz nameplate hidden, but not hidden well enough to me. also for some reason i'm near the dummies in two moons, the nameplates are blinking.